This page is for world hosts and developers. If you'd like a quickstart guide for regular players, click here. Final Minetest is a virtual worlds system that allows you to build worlds locally or to join communal worlds located on the Internet. The Windows package is the same except that it omits the server. This page discusses Minetest program setup; i.e., how to build, install, and configure the server and client programs. It links to other documentation as well. To build the program for 64-bit Linux, visit the Download Files page, download the Linux build kit, and follow the instructions in linux-minetest-kit.txt. This part is for experienced Linux sysadmins. * You can build the programs using a native gcc compiler or you can bootstrap a compiler. Bootstrap mode is much slower but may work better with older distros. * You can build either normal or “debug” versions of the programs. “Debug” versions are compatible with “gdb”. This is useful if you're trying to track down crashes. * To build the program for 32-bit or 64-bit Windows, visit the Download Files page, download the Windows build kit, and follow the instructions in mxe-minetest.txt. Note: The build kits have been tested, so far, on Debian 8, Fedora 28 and 29, Ubuntu 18.04 LTS, and Laclin (OldCoder's Linux distro). * Builds for 32-bit Linux should be working in the short term. Android and Mac OS X builds are a future subject. * Complete pre-built packages for 32-bit and 64-bit Windows are provided on the Download Files page. * Pre-built packages for Linux are coming in the medium term. The Final MT core engine is under git and can be cloned as explained further down. Other components are going to go into git as well. This isn't practical, though, for large pieces that incorporate binaries. We'd end up with repos that had histories in the terabyte range. But you're not going to want to download large tarballs frequently to get updates. As an alternative, we're planning to offer anonymous rsync or similar mirror features. If we go with rsync, you'll have a local folder containing build-kit files. Type a single command and it'll sync with upstream. Just the necessary downloads will be made. In a few minutes, your local folder will be an exact copy of remote. Final MT supports a per-world configuration file. It looks just like minetest.conf, but it holds world-specific settings, is named world.conf, and goes in the same folder as map.sqlite and world.mt. world.conf makes it possible to support a collection of worlds with different parameters without the use of command line switches. So, for the first time, it's possible to bundle such a collection with a distribution copy of Minetest. We recommend that world-specific parameters be placed in this world.conf as opposed to minetest.conf. To see a sample world.conf file, click here. The unique settings shown are intended primarily for use with Bucket Game. However, Final MT does support unique settings that can be used with all games. Details will be added here later. You can use your old MT maps and modsets. But Final MT doesn't support modsets dated after Spring 2017. Final MT works with worlds all the back to Kray's World and primeval sectors-format worlds. However, very old worlds require a special modset. The special modset will be publicly released in the medium term. One mod that we're aware of may cause the Final MT engine to crash: old versions of building_blocks. There is a single bad line in the mod that can be patched out. Details will be added here later. Old versions of Home Decor which contain the bad version of the mod will cause the same crash. If you like, you can use Final Minetest's built-in modset, Bucket Game, instead of your old modsets. Bucket Game isn't a drop-in replacement for old modsets. It's most suitable for use with new worlds. The new modset includes numerous improvements, including a version of WorldEdit with must-have features. For more information, visit the Bucket Game page. Final MT has its own server list that displays public Final MT worlds as well as Old MT 0.4 worlds. Final MT worlds don't appear on the Old MT server list. Old MT 5 worlds don't appear on the Final MT server list. The Final MT server list is compatible with a P2P setup. Each world host can run a server list to which his or her worlds will report. The server list will pull other worlds from other server lists. Nobody can be locked out of the communal server list by a single authority. Adjust the specified path to the executable appropriately. WorldEdit, spawn points, Mobs, and Realms are modset-level features. To read about CoderEdit, which supersedes WorldEdit, click here. To read about Bucket Game's versions of the other features listed above, click here. If you're not using Bucket Game, these features work according to your modset's rules. The Old Minetest tabs have been unreadable for years. Final Minetest corrects this. If you don't like the default opacity and/or color settings, you can now specify both at runtime. To do so, simply set the environment variable MTTABCOLOR to an 8-digit hex number. The first 2 digits specify opacity, with 00 meaning fully transparent and FF meaning fully solid. The next 6 digits specify an RGB color. The number may be formatted as 0x12345678. I.e. it can start with "0x". If it does, the "0x" part is ignored. After a restart of Final Minetest, the arrow keys will work. This feature is in build kits 190119 and above. If you're familiar with “shaders”, note that Final Minetest turns them off by default. The change took effect as of build kits 190120. For most people, this should improve performance and reduce glitches. In a few cases, however, the program might work better with shaders enabled. Shaders can be enabled using the program GUI or by adding enable_shaders = true to minetest.conf (terminate the program before editing the file). The Final MT for Linux build kit comes with LevelDB, including Snappy support. So, if you use the build kit, Minetest should be able to read and write all normal LevelDB maps. LevelDB is widely noted for being unreliable and databases it manages are prone to corruption. Academic studies of past versions of LevelDB have found that, under some file systems, the data stored in those versions of LevelDB might become inconsistent after a system crash or power failure. LevelDB corruption is so commonplace that corruption detection has to be built into applications that use it. If you're not familiar with the LevelDB to SQLite3 migration procedure, details will be added here. Note: Final MT for Windows comes with LevelDB as well, but presently omits Snappy. So, it won't be able to read some existing LevelDB maps. For support, you can email [email protected] or come to IRC. The button and/or link start a Kiwi IRC client that goes to live support. Support is on duty several hours a day, most but not all days. 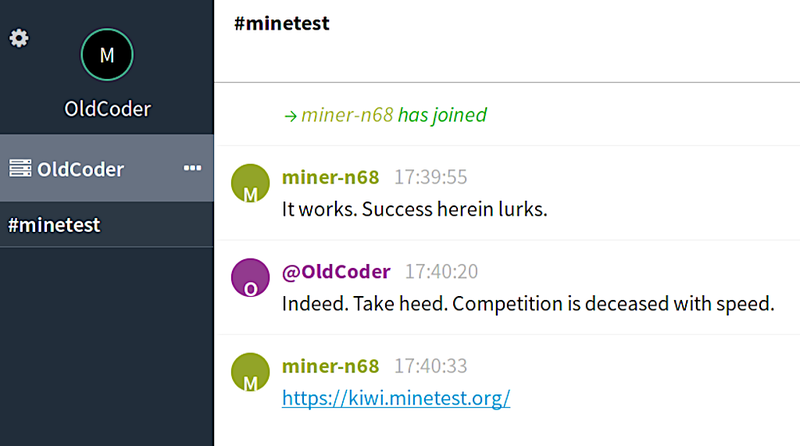 If you have a slow Internet connection, such as satellite, the Kiwi IRC client may not work for you. We may add a lighter client to use in this case. If you're familiar with IRC, you'll probably want to use your own client. Related details are in the Contact section.